Blog — SR3 Sealife Response, Rehabilitation, and Research improving the health of marine wildlife. What a week! SR3’s Dr. Holly Fearnbach and her colleagues from NOAA’s Southwest Fisheries Science Center completed two more dolphin surveys in the coastal waters off San Diego County. They were able to collect photo-identification images of and fly a small, unmanned hexacopter over 40 individual dolphins, bringing the count to over 100 individuals this year! Images collected on these surveys will be analyzed to assess the health and monitor the status of this local population of bottlenose dolphins. This study is supported by the SeaWorld and Busch Gardens Conservation Fund, SR3, NOAA Southwest Fisheries Science Center, and Pacific Life Foundation. Aerial images of two groups of coastal bottlenose dolphins off San Diego County. Images were taken with an unmanned hexacopter at >80ft altitude, with authorization under NMFS permit #19091. Dr. Holly Fearnbach, SR3’s Marine Mammal Research Director, just finished an extremely productive month of collaborative research on whale health around the Antarctic Peninsula. She was joined by Dr. John Durban and Trevor Joyce (NOAA Southwest Fisheries Science Center), Leigh Hickmott and Jessica Farrer (SR3) onboard Lindblad Expedition’s National Geographic Explorer to conduct research assessing how top predators (killer whales) and top consumers (humpback and minke whales) are impacted by the rapid warming of this marine ecosystem. Aerial photograph of a group of Type B2 killer whales in the coastal waters of the Antarctic Peninsula; note young calves swimming below their mothers. Images were collected from >30m (100ft) above the whales using a small unmanned hexacopter. Research conducted under NMFS Permit No. 19091 and Antarctic Conservation Act Permit ACA 2017-029. To extend long-term population monitoring (since 2004), they collected photo-identification data from 12 groups of killer whales comprising Antarctic Types A, B1 and B2. Laser measurements of body size were collected from killer (Type A and B2), humpback and Antarctic minke whales to infer trophic requirements. Using a small unmanned hexacopter, they were able to collect aerial images from five killer whale groups, comprising more than 80 Type B2s, eight Type B1s and six Type A killer whales. Photogrammetry measurements from these images will be used to monitor body condition to assess nutritional status and will add to data collected from 2016-2018 on the body size of the different types to understand the energetics underpinning their predatory impacts. Unlike previous years, no emaciated whales were documented, but a large number of new calves and several pregnant females were photographed. Aerial images were also collected from 11 humpback whales, matched with 2 blow samples- these paired image/blow samples will be used to link the respiratory health of individual whales to their body condition. A big surprise of the season was that the team documented almost two dozen Antarctic blue whales in nearshore waters of the Antarctic Peninsula. Historical whaling reduced the Antarctic blue whale population to < 1% of its original size, but increased sightings in recent years is a great sign for the recovery of the population. This study is supported by the Lindblad Expeditions-National Geographic Conservation Fund (LEX-NG), NOAA Southwest Fisheries Science Center, SR3 and Pew Charitable Trusts. Aerial photograph of Type A killer whales carrying chunks of a recently killed minke whales, their preferred prey species. Images were collected from >30m (100ft) above the whales using a small unmanned hexacopter. Research conducted under NMFS Permit No. 19091 and Antarctic Conservation Act Permit ACA 2017-029. Limited edition t-shirt available from Barefoot Eco Outfitters, all proceeds benefitting SR3! For the second year in a row, Dr. Fearnbach and her colleagues are evaluating cetaceans off the coast of San Diego. There is a high level of concern about the health of a young Southern Resident killer whale, J50, who has been documented to be in very poor body condition in recent months. 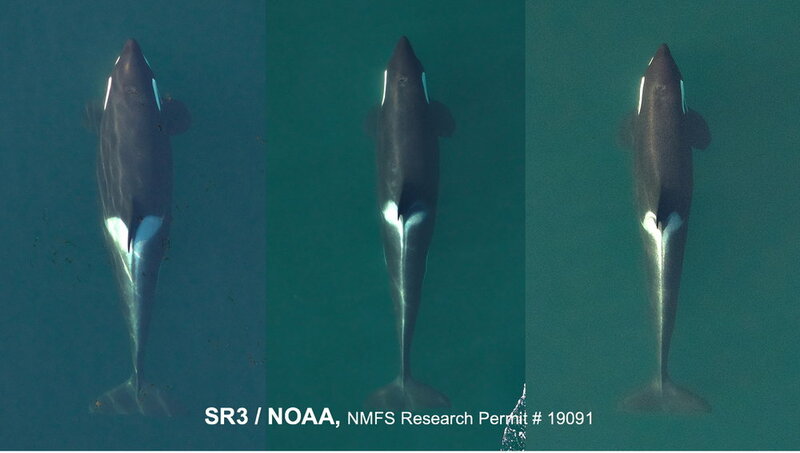 SR3's Marine Mammal Research Director, Dr. Holly Fearnbach, and her NOAA colleague Dr. John Durban, have succeeded in capturing overhead images of ailing Southern Resident killer whale youngster J50, during their emergency field effort to assess her condition. While in the San Juan Islands, Dr. Fearnbach and her colleagues collected data on 3 large whale species as part of an ongoing nutritional health study. Gray, humpback, and minke whales all made an appearance! Dr. Fearnbach and colleagues got great images of Bigg’s killer whales during their May health assessment of whale populations in the San Juan Islands. Emaciated elephant seal pup receives critical medical care in SR3 marine wildlife ambulance during transport to San Juan Island.